This blog chronicles the day to day story of our motorcycle journey from Canada to Argentina. There was up, down and sideways moments, but overall it was a great experience. I hope you enjoy our story, and please get in contact if you have any questions or maybe you just want to say hi. Please use the Archive on the right hand menu bar to start at the beginning of our story. Also please check out our new website MotoLara.com for interesting content and projects. Hit us up on social media, we love to hear from you guys. I am very proud to announce that 3 of our photos from our trip were selected to be featured in the HUBB 2012 Calendar. Thank you to everyone who voted, there is an amazing selection of pictures in the calendar! Two years in a row! We are very happy to announce that two of our photos were selected for the HUBB 2013 Calendar. Thank you for the support. 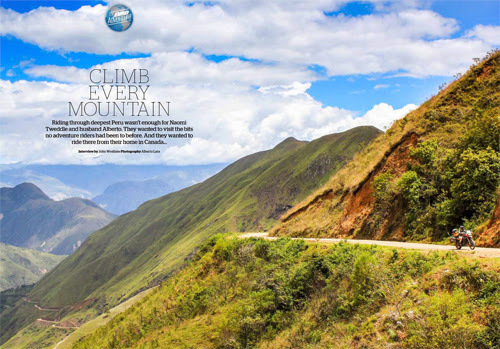 So proud to have our story featured in Bike Magazine!